I had initially not intended on making videos today, because as a student I have other priorities. Like lecture notes. And homework. And sleep. But when I saw that the mod in question was by the infamous Virtua Simulazioni (VS) studio, I knew I had to get on it ASAP and decided to drop everything. Two hours later, and I can happily say that this car is worth procrastinating for. If you also own Assetto Corsa (for the PC) and you haven’t heard of Virtua Simulazioni by now - well, let’s just say you need their mods in your life. So far they’ve only released two cars for the game, but both have captivated the user base and gotten high praise because of their amazing attention to detail (including liveries), excellent physics model (including sounds), and frequent updates across game versions (something that many other mods don’t bother with). Yes, it’s that Formula 1 concept car! The one that even Speedhunteres covered in a story detailing what the sport could look like if it was really about spectacle and less about efficiency. Unfortunately, the concept never made it past the 2D space (at least in the public eye) and Ferrari never released any physical details about what lies beneath that Modena skin. Even so, VS did a remarkably good job at giving us a driving model, and even if you don’t agree, you have to admit that they at least got the exterior spot-on with surprisingly few reference articles. I’d equate this car to the Redbull X2014 cars of Gran Turismo - meaning, and VS affirms this idea, that this car is a “concept of a concept” designed to “give people the ultimate F1 experience.” Assuming they built upon the MP4-13 physics they had before, this car is already off to a good start. The designers weren’t restricted when it comes to design, and VS have adopted the same approach to what lies underneath. Weighing in at a mere 700 kg (1,543 lb), one begins to question exactly how much downforce that aero actually produces - especially compared to the current F1 cars. Regardless, this concept definitely has them beat in terms of sheer speed - in place of a turbo V6 is a turbo-charged V12. Yeah, that’s right - a V12 hybrid. Power output is approximately 1,000 bhp, with 22% of that sent to the ground via the ERS. Torque is approximately 436 Nm, which as a package is enough to get the car to 100 kph (62 mph) in 2.2s. Other things to note are the digital cockpit, which while simple is extremely effective by way of sequential shift lights and a dual-purpose LCD in the center of the “steering wheel.” Like in the SCG003Cs, the cockpit is also flanked by LCDs in place of traditional mirrors - one directly in front of the face and two (one on each side) in place of their analog counterparts. If you look closely as the car drives past, you can just barely make out the lenses mounted near the side pods. Rumoured to be coming to the sport for years, this car also runs on 18.5in sized rims - no more 13in silliness that’s on the current cars. But what you’re all wondering is how it drives. Full disclosure, I’m only about an hour in with this car so take what I’m saying with a grain of salt. If I was to compare this car to what is available in Project CARS at the moment, this would be categorized as a Super Formula B (GP2) car - easy to drive, yet challenging at the limit, and with as much or more power as the full Formula 1 cars. The weight isn’t as much of an issue as you’d think though you do have to be weary of your throttle position when going through corners in order to properly maintain momentum. Speaking of throttle, power delivery is probably your most challenging bit - like any LMP1 car, you have to adjust to when the “boost” kicks in. Only issue here is that the Concept relies more on its turbo boost than it does the actual ERS - but at least you can adjust it in the cockpit (boost is also varied depending on what gear you’re in). The gearbox is lightning quick as you’d expect and the 8 forward gears aren’t a hinderance at all, especially since the brakes are mega - though like the throttle, you can lock them in a heart beat. Lastly the tires - the Pirellis are updated to Version 5 spec, which basically just means they have better contact patch physics and better account for how the tire heats up and how it looks at various pressures / wear patterns. Wrapping this post up - the sound. Oh my, what a sound. I had originally though that the V10 in the MP4-13 sounded heavenly, but after hearing this I’m not entirely sure how to describe it. A V12 naturally sounds awesome (a la F12 or Vantage) but add in the unmistakable turbine sound and it just sounds outright menacing. The gearbox actually cracks like lightning on the downshifts, and I have no doubt that it would shoot flames in real life. Again, keep in mind I’ve only gotten an hour or so in the car so my lap times could improve just a bit. Assists are set to factory (no ABS, no TC); not related to performance, but I chose the Kimi Raikkonen livery over the Sebastian Vettel one because Kimi knows what he’s doing. Enjoy the onboards! 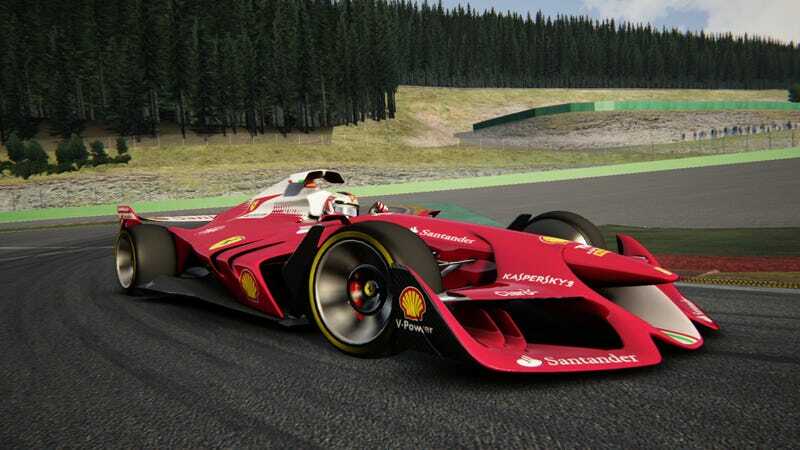 In creating the Ferrari F1 Concept for Assetto Corsa, Virtua Simulazioni team took on a project primarily inspired by the Ferrari designers and spun it right on its head. This ‘concept of a concept’ was never intended to be a 1:1 scale replication of the original design in both shape and expectation of engine technology. Its objective was not only a test of the limitations of the game, but also to be used as a platform to freely explore new creative ideas. So are you looking forward to drive this car for yourself? Let me know your thoughts down below! Below are some useful links to the car itself and some images from the Showroom.